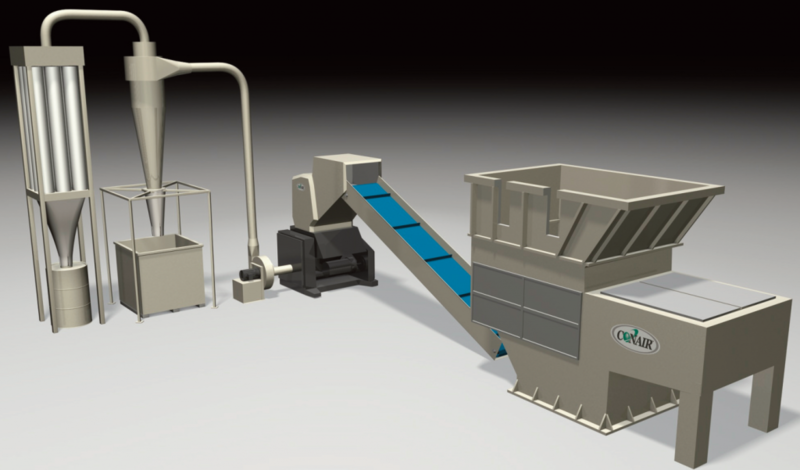 Just because plastics granulators and plastics shredders operate differently, and each has different advantages, does not mean that processors have to choose between them. Often, these two size-reduction methods complement each other: shredders perform coarse size-reduction, with scrap subsequently channeled into a granulator for final sizing into consistent, uniform feed material. If you look closely at the kind of scrap generated by your process and think about how it will be handled after size reduction, it should become clear very quickly whether you need the brute force of a shredder or the finesse of a granulator. A supplier that can offer you both options will be able to help you analyze your situation and make the best decision for your particular process situation. Types Compact, “beside-the-machine” or larger “central” granulators. Typically centralized, with either single-shaft or dual-shaft design. Regrind size and purpose Produce uniform granules similar in size to virgin pellets, enabling regrind to go back into production. Reduce scrap down based on filter size (<1 in. up to 2 in.) to sell to recycler. Feeding back to production typically requires further granulation. Scrap size, feed rate Continuous, gravity feed (manual, robot, conveyor) of light to medium scrap (sprues, runners, off-spec parts, trim from one or more machines). Special “hog” granulators handle extra-heavy scrap. Continuous or bulk feed of any high-volume scrap, including large, bulky parts/purgings from multiple machines. Material is ram-fed from hopper to cutting rotor. Operation High-horsepower, high-RPM, low-torque motors made to take small bites of scrap at high speeds. Keep cutting until uniformly small, process-ready size is achieved. High-torque, lower RPM, with shafts/rotors/ knives optimized to tear through a continuous feed of heavy, dense scrap. Processed scrap of varied sizes, more dust and fines. Limitations More likely to “choke” on heavy parts, purgings, film rolls. Heavy scrap may need to be cut-down in size and fed gradually. Inefficient for low throughput, lightweight materials, but ideal for “dump and forget” – the bigger, denser and heavier, the better. Granulators and shredders are vital pieces of auxiliary equipment for plastics processing facilities, and it is important to examine all factors and your factory’s needs when choosing which is best. This illustration shows a two-stage system that could automate the process of shredding and subsequent granulation for optimum regrind quality and uniformity.